Well, Quebec City has finally had its first major food event. 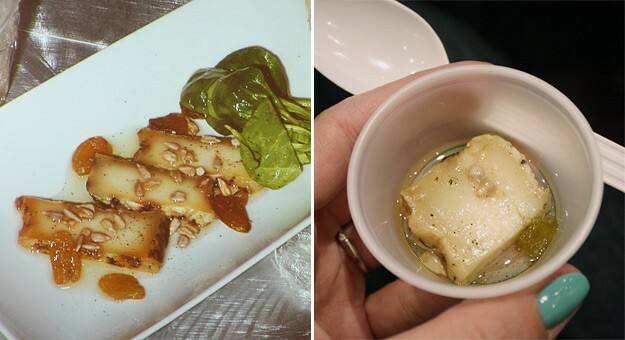 Sure, there are a few tradeshows that take place every year, but we had yet to host a fully fledged conference with chefs, and demos, and tastings, and networking opportunities—and fun! It was called FoodCamp Québec, and it all happened thanks to the determination of one of Québec’s foremost bloggers, Francis (Tranche de Pain). I truly admire people who stop wishing and start doing. I mean, I’ve been wishing for a conference to happen in Québec, like those I fly miles to attend, but truthfully, I never even thought of organizing one. Why not? Francis created the event he dreamed of attending (and he had never done anything like this before). I have to say, he and his team did a fantastic job. The events ran smoothly, the sessions were unique and interesting, the food was fantastic, and the crowd was delightful. I cannot begin to tell you how great it felt to spend the day with people who share this deep, overwhelming passion for food; chat with some of Quebec’s most influential chefs; and indulge in such flavorful local cuisine. 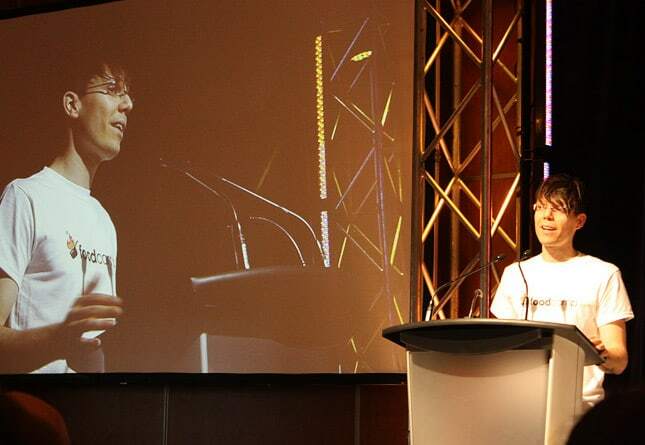 The event’s organizer, Francis Laplante. 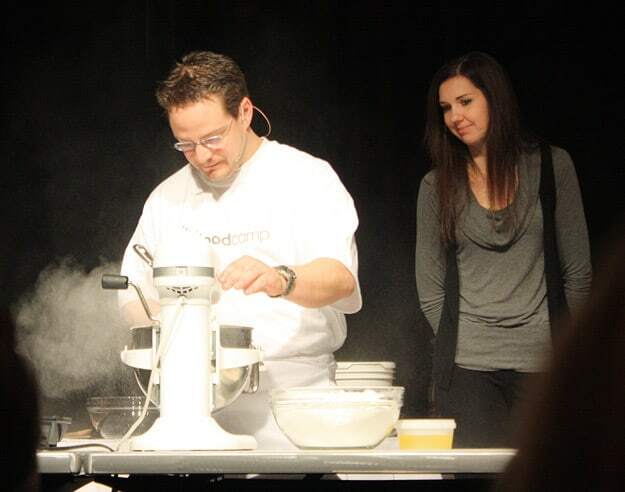 FoodCamps are a relatively new type of conference. 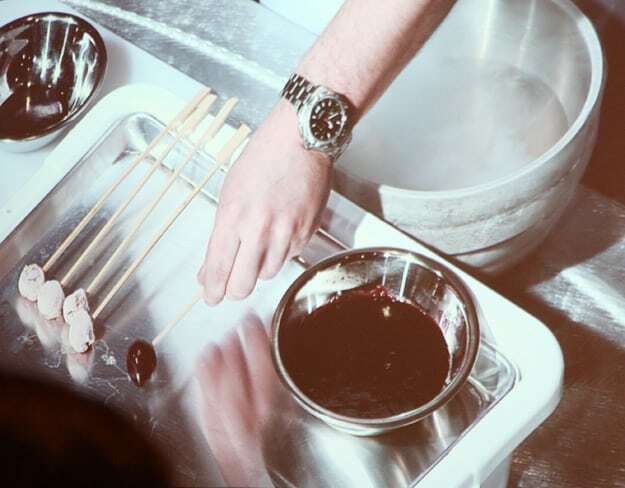 There have been some in Italy, a couple in France and another in Copenhagen, Denmark–organized by René Redzepi, no less. They evolved from the BarCamp concept, which is an “international network of user-generated conferences” (source: Wikipedia). BarCamps are about technologies and software development. The first one was held in Silicon Valley, California, in 2005, and it has evolved to become a worldwide phenomenon (with BarCamps having been held in over 350 cities worldwide since then). The format has now been used for a variety of other topics, including—you guessed it—food. The goal of a FoodCamp is to gather chefs, artisans, and producers to highlight the cuisine of a particular region. In Denmark, Redzepi’s MAD FoodCamp celebrated the country’s seasons, harvests, and foods, which all together define what Nordic cuisine is. 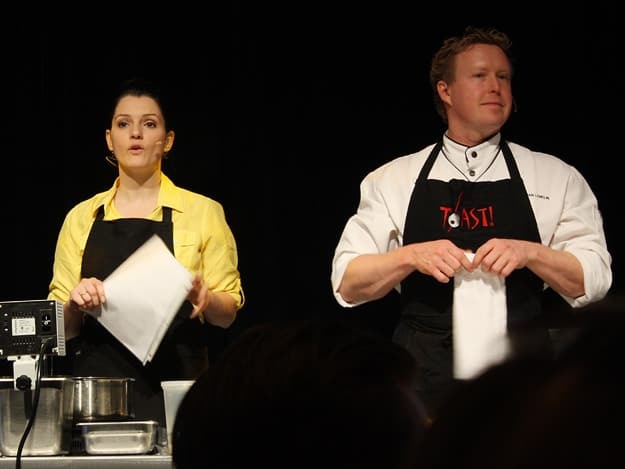 In Quebec City, seven of the province’s best chefs partnered with terroir producers and wine makers to create recipes they demonstrated on stage. There were also exhibitors who provided tastings, which we could enjoy during breaks. 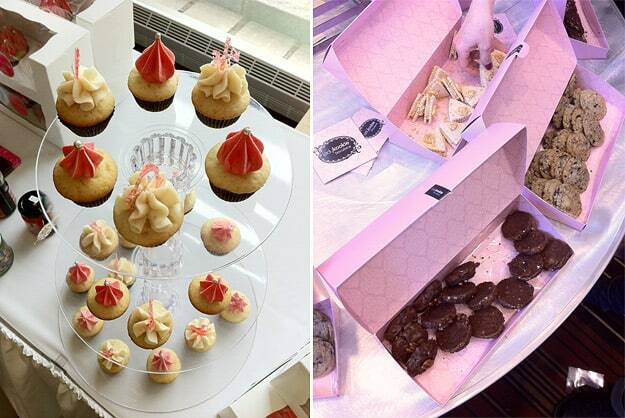 Food conference attendees love cupcakes and cookies, of course. It was a delicious and inspiring day, and I loved the opportunity to see where our chefs are heading in terms of flavors and techniques. Some of them love basic, comforting (but reinvented) dishes and classic techniques, while others steer toward the modernist movement. I noticed a growing popularity of the up-and-coming “Cuisine boréale,” which seems to be Quebec’s answer to Nordic Cuisine (using ingredients foraged from the province’s boreal forest). Here are highlights from the conference. I’m already counting the days before next year’s edition, hoping it’ll last two days (with hands-on workshops on the second day!) One cannot be too demanding, right? I will, for sure, offer my help to Francis; I have a feeling that with this year’s success, he’ll need it. About Bistro B: A laid-back modern bistro with an ever-changing seasonal, terroir menu. Cooking with: Émeu de Charlevoix and wine from Vignoble Ste-Pétronille. We ate: Emu tartar (made with cranberry seed oil, shallots, raisins, dried cranberries and lemon juice) over a Mistelle jelly. About La Tanière: An institution located on the outskirts of Quebec City, the restaurant used to specialize in wild game, but has taken a turn towards the modernist movement in 2002. 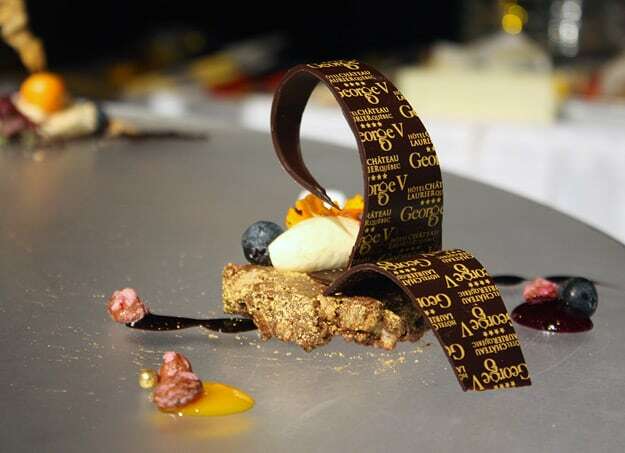 They now serve “avant-garde cuisine”, tasting menus with 10 to 20 courses that feature the very best local ingredients. They are amongst the leaders of the “Cuisine boréale” movement (the phrase is actually the restaurant’s tagline). Cooking with: Hen from Domaine de Lavoye and wine from Vignoble Carone. We ate (and drank): Hen liver mousse, dipped in cherry jelly (thanks to liquid nitrogen), and served with quinoa, endives and garlic powder. The wine was a surprisingly delicious Pinot Noir (a grape that is very rarely grown in Quebec). La Tanière’s Chef Frédéric Laplante and partner-owner, Karen Therrien. Playing around with liquid nitrogen. About the performance: The chef plated six spectacular desserts made with blueberries and chocolate, accompanied by dubstep music and lighting effect. 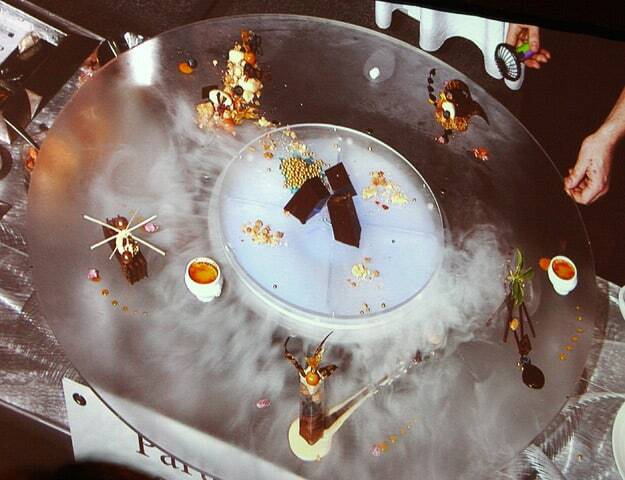 All of the desserts used the same basic components but they were organized differently to create each dessert. 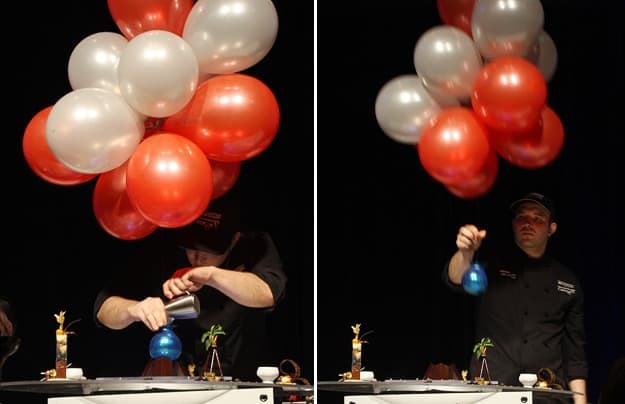 It was quite a mesmerizing and magical performance, unlike any cooking demonstration I had ever seen before. We ate: A miniature dessert, featuring all the key components used by the chef (blueberries, crumble, chocolate and coulis). A video of the performance (filmed with my iPhone). Pastry & dubstep! Who knew? The performance ended with a giant blueberry (made out of sugar) sent floating over the stage. 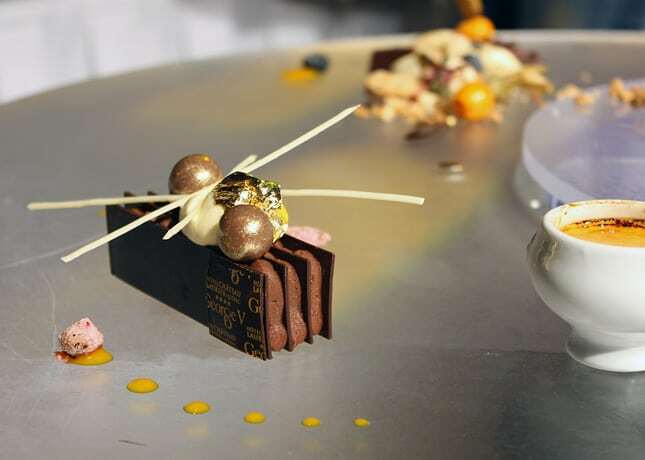 Chef Camus assembled the desserts on a large, round, rotating glass surface (the music scratched when he turned it between each plating). One of the desserts, up close. Cooking with: Chicken. The session was called “My friend the chicken”. 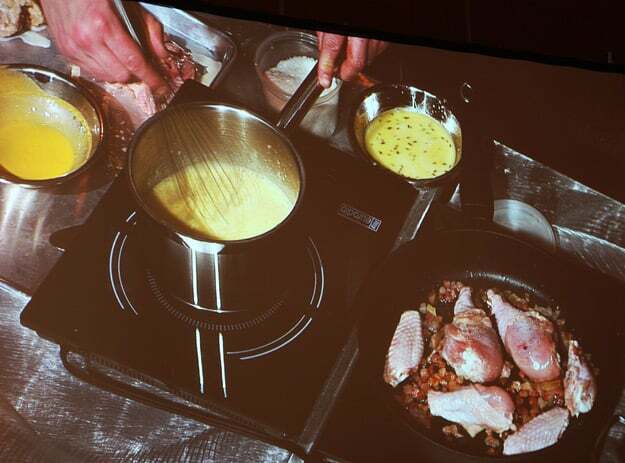 Chef St-Pierre demonstrated how to make the most of a whole chicken and turn it into many different dishes: in an hour, he made a blanquette of chicken, a grilled breast with perfectly crispy skin, a pot-au-feu and a chicken cassoulet. We ate: A to-die-for Kiev chicken croquette. The Kiev chicken mixture was frozen, cut into squares, dipped into egg and panko crumbs repeatedly and then fried, so that the exterior was very crisp but the interior was melted to its original state. 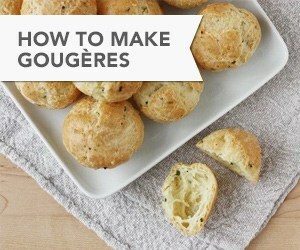 The croquette exploded in savory deliciousness – it was one of the best surprises of the day. 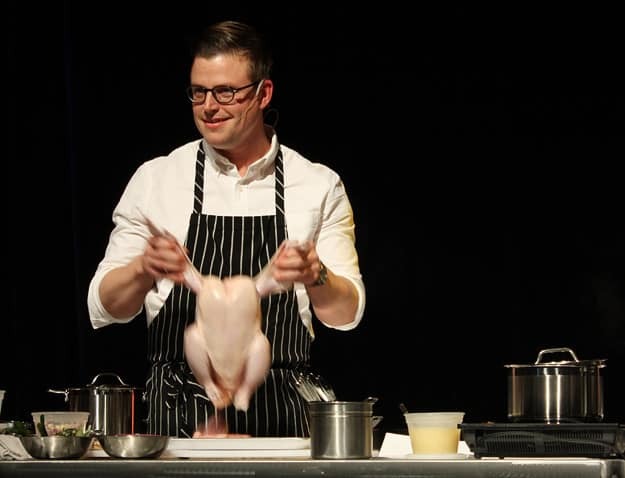 Raw chicken on 20-feet screens, courtesy of Chef Danny St-Pierre. Blanquette and cassoulet on the way. 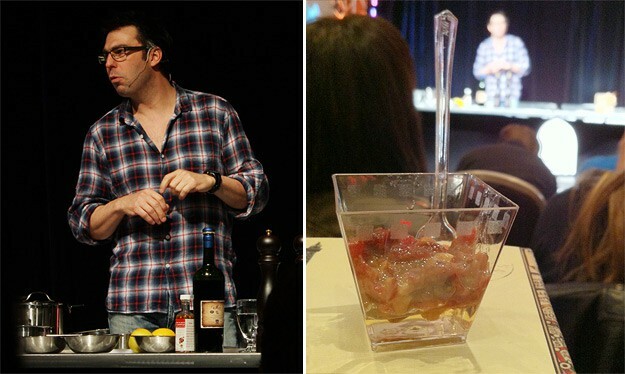 Left: Chef Phil Viens of Restaurant DNA in Montréal, with a representative of Société Original. 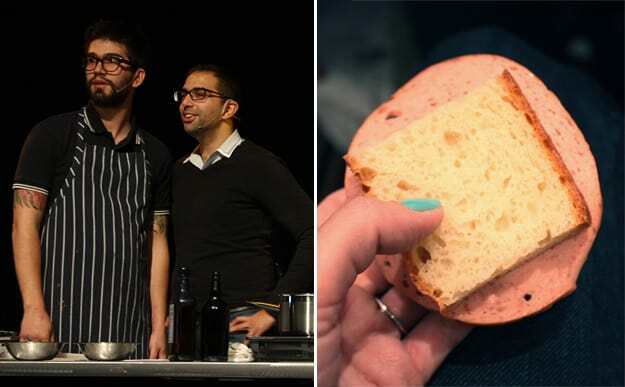 Right: Chef Viens’ “Baloney” sandwich. About Toast! and SSS: Toast! is a gourmet restaurant housed in a boutique hotel, in the city’s most charming neighborhood, the Old Port. Their specialty is foie gras, and they just changed their menu to serve small dishes, which you can assemble to create your own tasting menu. SSS, located a short walk away from Toast!, is a chic bistro that serves accessible but sophisticated dishes. It’s a popular spot to have an after-work happy hour or grab a late-night snack. Cooking with: “Boreal terroir products” from Société Orignal. Chef Lemelin also demonstrated how to make your own foie gras au torchon (cloth wrapped duck or goose liver), including how to devein and season the liver before wrapping it into cloth. We ate: “Mauvaise herbe” goat cheese, cooked sous-vide in a water bath until warm but still holding its shape, then drizzled with Volte-Face sunflower oil and sprinkled with sunflower seeds. Also: Moutain Alder-infused Panna Cotta (set with agar-agar) with an orange emulsion, candied pecans and an exceptional maple syrup, the “Chasse-Gardée”. This syrup is boiled to 72°C (instead of the usual 60°C), which means that more liters of maple sap are required to produce the same amount of syrup. It’s a gourmet version of maple syrup, probably the finest most of us in the room had ever tasted (and believe me, we know our maple syrup). 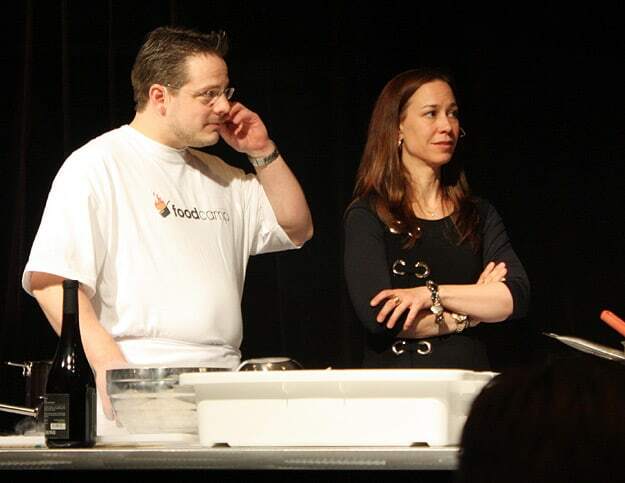 The FoodCamp’s host, Chef Marjorie Maltais, and Chef Christian Lemelin. 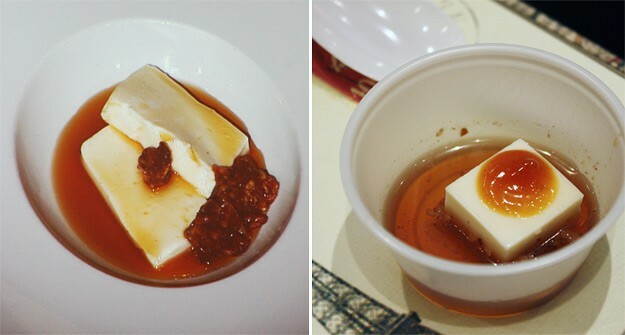 The cheese course, as plated by the chef, and as it was served to attendees. The panna cotta, as plated by the chef, and as it was served to attendees. Aren’t all those dishes making you hungry? Wow! The food looks delectable!! Am a total foodie and I would certainly have loved to be at the FoodCamp to enjoy all those delicious looking snacks. Next year I can’t afford to miss out on this amazing event and I’ll actually travel all the way from New York to Quebec to attend the FoodCamp. Thanks Marie for this amazing post. Thank you so much for this thorough and complete article. I especially appreciate the video of Sebastien’s performance. It allows me to finally make myself clear when I try to explain what the Foodcamp was to my non-foodies friends! Happy you like the post Isabelle. Congratulations to you for being part of such an amazing event! I truly admire what you all accomplished together and I already look forward to the next edition. It sounds like a knock-out first event for Quebec City’s food scene and as always, loved your incredibly descriptive post and take on the food movement there. It was a really great event, heart-warming in a way. I left proud and happy to see what creativity was happening in my hometown! I will be there for sure Francis, I can’t wait! It was a great and delicious day indeed! Are there food conferences happening in Calgary yet? I’m kinda jealous of your growing street food scene… I can’t wait to visit!